Jet milled pesticides, herbicides and other plant related products will cover much more surface area using less of the active ingredient thus reducing cost. 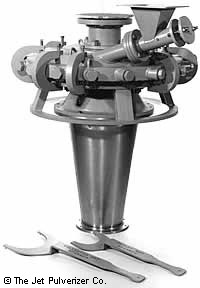 Cosmetics manufacturers are continuously looking for finer particle sizes and the Jet Pulverizer Company has offering solutions since 1947. Cosmetic manufacturers are always looking for the finest particle sizes to provide their customers the best wearable makeup. Micronized minerals like titanium dioxide and zinc oxide are used extensively in cosmetics. The use of micronized minerals in make-up produces a lustrous, smooth and glow-like finish to the skin and enhances the feel and appearance of the product itself. Large cosmetic manufacturers depend on micronized form ingredients to achieve the finest product quality and applied finishes. Jet Mills have become the preferred micronization tool for these manufacturers thanks to their very low contamination, narrower spread of particle sizes, robustness and ease of use. A mine-mouth amorphous silica plant was looking for more efficient jet mills with longer wear life. A competitor’s mill was regularly taken out of service after running two weeks and rebuilt. During this rebuilding a second unit was put into service and the mills were alternately run and rebuilt on a two week on and off schedule. We guaranteed 25% greater throughput, no contamination and that the ceramic liners would be serviceable for one year. All three objectives were achieved. Greater capacity was achieved than expected and the product was very fine and white. Two years later the first ceramic part was replaced. The Micron-Master® replacement had a throughput twice that of our competitor’s mill using the same quantity of energy and achieving a particle size as fine or finer than previous. A major dry film lubricant manufacturer needed to mill a special product fine enough to pass through the filter of an automobile engine when suspended in oil. After testing every jet mill on the market they eliminated all but the Micron-Master® Jet Pulverizer. We developed a special unit for them to achieve a 100% minus specification on a product that was already superior. A large scale, unique design mill was quoted, purchased and installed. The product was a commercial success and now many years later the special Micron-Master® is still in full production. Recently, improvements were made in the linings to prolong service life and increase productivity. As an aside, in this company as in many others, whenever experienced personnel are lost from retirement etc., Jet Pulverizer engineers are there to train new people and solve milling problems to maintain continuity. A biological laboratory needed to jet mill extremely small samples with no contamination. We had previously developed a tiny 1″ diameter mill for the US Army for research on similar materials. To the best of our knowledge it was and still is the smallest jet mill in the world. We redesigned that mill to include tungsten carbide linings and integral cyclone collector. To the collector discharge we added a tiny centrifuge tube for collection of samples. This mill is in use today grinding one gram samples with 80% collection efficiency. Larger samples are collected with 98 – 99% efficiency. A mining company was looking for a way to produce low micron size Wollastonite used as a substitute for asbestos and is an excellent plastic strengthening material. The goals were for narrow particle size distribution, high thru-puts and minimum maintenance. The problem was the extreme abrasivity of the material, wearing out traditional mills in hours. Our BSF Micron-Master® was chosen for the task because of its unique ceramic lined distribution head. This mill produces sharp particle size distribution curves without any mechanical classification and does it with very little wear. After a year of 24/7 operation, the first part needed replacement. A permanent magnet materials processor needed finer rare earth materials such as samarium and neodymium compounds to make stronger magnets. The materials are very abrasive and spontaneously combust in air. Since the production rate was small, an 8″ Orbital Micron-Master® was specified for the job. Liners of sintered tungsten carbide were designed for all contacting surfaces for best wear resistance. A closed loop gas system was designed to allow nitrogen gas to be recycled in a continuous loop through the mill to minimize make-up gas. 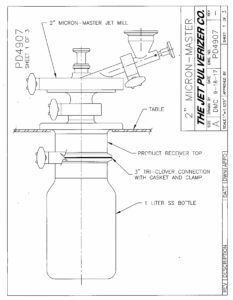 Subsequent to this project several other recirculation systems were set up using the Micron-Master®. The largest recirculation system to date was a 36″ mill using 3000 SCFM of nitrogen to grind a fungicide.